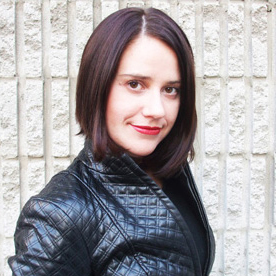 Choosing a moniker for your newbie can be daunting. Here’s how to pick the perfect one for your babe. Since her name is mispronounced daily (it’s Dah-na, not. Day-na) and her last name is prone to nicknames (a couple of friends call her Daisy—get it? ), Duke wanted something simple but unique, cutesy-nickname-free and meaningful. By chance, Duke, a wildlife biologist who used to track wolves, came across Tala. “It’s actually a native word for ‘stalking wolf,’” explains Duke, a tidbit her now four-year-old revels in telling anyone who’ll listen. As such, even the most popular names—topping the last decade’s lists were Emma and Jacob—are a fraction of what they were. They’re being slowly replaced with creative alternatives: new spellings (Abbigayle), locations (Brooklyn), letter order (Nevaeh—heaven backwards), dividing (Alex and Zander for twins) and even blending (Twilight’s Renesmee, a mash of Renee and Esme). If all of these sound wacky, you might instead choose a traditional name. But even these are trendy—Ava and Olivia, for example, are 100 times more popular than ever and sit firmly in the top 10. Jessica and Tiffany, popular throughout the ’80s, are now too close for comfort; Gertrude and Edna, however, have yet to make a comeback. But, like shoulder pads, never say never. 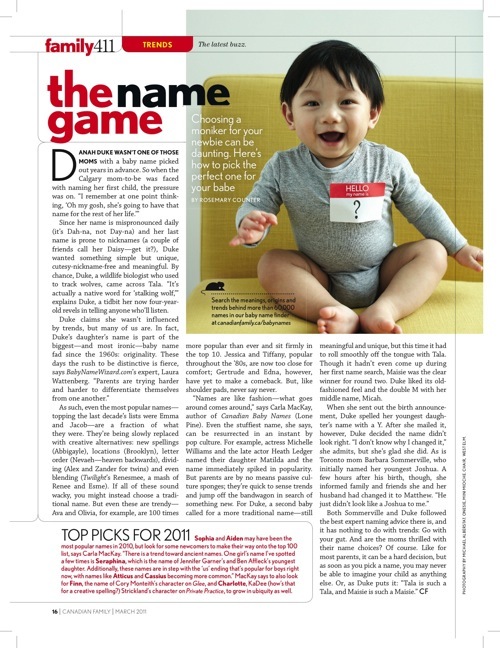 “Names are like fashion—what goes around comes around,” says Carla MacKay, author of Canadian Baby Names (Lone Pine). Even the stuffiest name, she says, can be resurrected in an instant by pop culture. For example, actress Michelle Williams and the late actor Heath Ledger named their daughter Matilda and the name immediately spiked in popularity. But parents are by no means passive culture sponges; they’re quick to sense trends and jump off the bandwagon in search of something new. For Duke, a second baby called for a more traditional name—still meaningful and unique, but this time it had to roll smoothly off the tongue with Tala.